A pair of Turkey Vultures are nesting on one of the lower (layered) roofs of the office building on the SE corner of Sherbourne and Bloor, in Toronto. I was walking on the other side of Bloor when I noticed one of the birds stretching its wings, as it perched on the edge of the roof and surveyed the area. Then it took off. While its partner took up the watching location, small, fluffy white feathers rose from the roof area. Obviously there is a nest, perhaps with babies. Saw one at Yonge & Weldrick in Richmond Hill, it picked up a squirrel. Took a video. Wow! 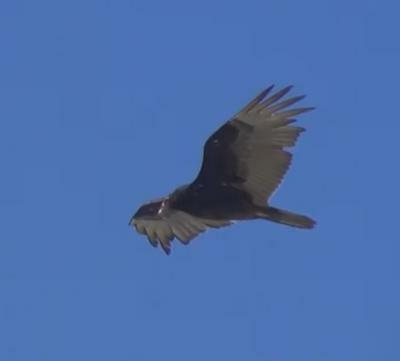 I understood that Turkey Vultures only eat carrion, but Black Vultures do hunt. I wonder whether you saw a Black Vulture? They are being observed in Southern Ontario these days. I saw easily 20 in the sky today around Yonge & Lawrence..
I’m fascinated by birds and there intuitions, I’ve never experienced a sight like this in Toronto (anywhere for that matter, I’ve seen less even circling the dump or up north over a carcass) almost thought I should be following them to potentially get away from some pending danger (again, their intuition far supercede ours). I wish I could post the video... anyone with any clues as to what was up today? My guess would that be that they are in the process of migrating south now that the weather is cooling down. They gather in large groups, called "Kettles" and drift south-ward. This is going to sound unbelievable, but it's true! Yesterday we saw 17 (yep, that's SEVENTEEN!) Turkey Vultures cruising east to west!!! We live on Roncesvalles Avenue near High Park. I've traveled extensively in the southern U.S.- and the only time the count was that high was in southern Texas - a huge group of vultures were enjoying cleaning up an entire cow. My theory is that these wonderful Toronto Turkey Vultures are roosting in High Park. I love watching them settle in for the night - mostly in the branches of large trees. They don't glide in and gracefully perch. They come zooming in and when they're close to a good looking branch they just CRASH into it! They are fantastic raptors with the most acute senses of sight and smell. I'm thrilled we saw them - and doubly thrilled they're here in Toronto! I saw a turkey vulture at Sheppard and Bathurst. It picked up some type of carcass on the roadway (during traffic 4:40 pm) and then perched itself on the roof of a home. Its red featherless head was unmistakable. I sighted a Turkey Vulture perched on a school yard fence at St Elizabeth Catholic HS in Thornhill. There are currently four Turkey Vultures spiralling around at Brock and 401. This terrifies my parrot who is convinced they will eat him! I counted at least 9 birds flying over the bridge at Castle Frank. Never seen so many at once. 2 birds spotted perched on top of the building. One with wings outstretched the other was laying belly down with it's wings draped over the walls. Coolest bird scene ever. This was at 16 York Mills Center April 3rd 2018 0745 hrs. I'm so glad to hear that these wonderful birds are nesting in downtown Toronto. They'll be good company for the Peregrines and Red Tailed Hawk - some cleanup to go with the pest control. The first one I ever saw in Canada (about 20 years ago) was in downtown Toronto, cruising majestically past my 66th floor window in the Scotia Tower. This week I've seen singles or small groups most days cruising my neighbourhood - Leaside, in mid-town Toronto. Maybe they've established a colony in Sunnybrook Park? I saw one sitting on the gatepost of the University of Toronto's residence near Glen Road, on April 10, 2018. I saw a Turkey Vulture today munching on a carcass on Kennedy Road in Scarborough today. Wow! One soared past my head and landed on my garden shed to jump down on the other side. I grabbed my camera and ran around my house (I'm beside a parquette) and there he was eating his mouse lunch. DON MILLS! By The Shops! In Toronto! I am looking at this page in Google Chrome and there is no picture? Do I need a plugin for this page? Hi Anon, no there is no picture with this report - the person who wrote in to tell us about the nesting Turkey Vultures in Toronto, didn't get a picture. I might add a picture of a Vulture when I have a minute!